"I would not want to split a check with Bernie Sanders," Colbert said. "This brunch is rigged!" Stephen Colbert thinks Tuesday night's Democratic debate was different. There were no personal attacks, no salty language — except, from the back wall, which for some reason kept repeating 'f CNN'" (the debate was cosponsored by Facebook and displayed its logo before CNN's). Colbert played a video splicing all of times Vermont Sen. Bernie Sanders was yelling out percentages around different policies. "I would not want to split a check with Bernie Sanders!" Colbert joked. He then broke into one of the most hilarious impersonations of Bernie Sanders you'll see, going all "old man" over the check at brunch. "What is this?! Five percent of the people at this table are paying 40 percent of the tip, which should be 50 percent! Twenty percent for good service, or 18.5 percent for a party of six or more. I am tired of the great majority of seltzer drinkers footing the bill for a small number of mimosa drinkers. Yes, I did take a bit of the fruit plate, but I was on record as against ordering it. The point is: This brunch is rigged! This brunch is rigged!" Colbert then moved on to Hillary Clinton, a frustrated mom telling Wall Street bankers to "cut it out" and that they would have to go to bed without their cocaine if they don't shape up! 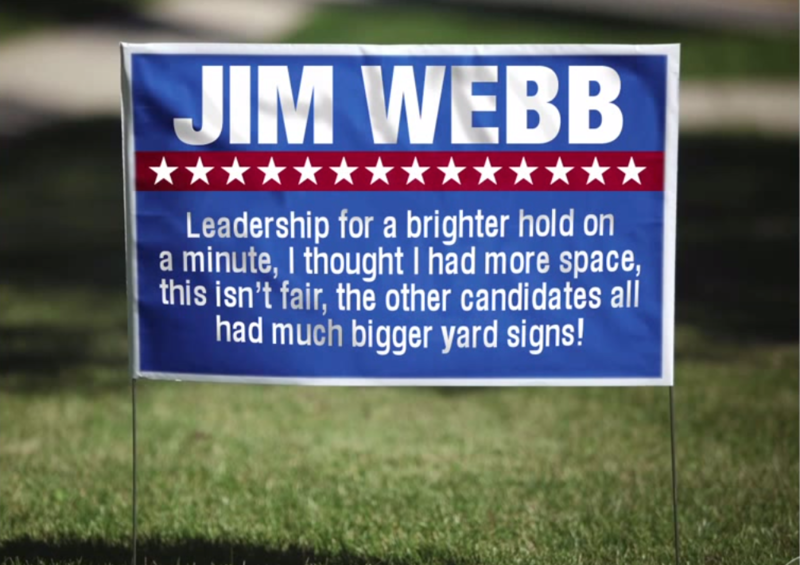 He then moved onto former Virginia senator and man holding in a burp, Jim Webb, who was perfectly characterized with a law sign complaining about how little real estate it had. "A powerful message," Colbert said of Webb's insistence that he have more time. Finally, there was poor Lincoln Chafee... "The guy I really felt bad for, was Rhode Island governor and winner of the 'Why I Should be in This Debate High School' essay contest, Lincoln Chafee. He didn't get asked too many questions and when he did they mostly looked like this," Colbert then ran the unfortunate moment where Chaffe pulled the "my dad died" excuse for why he didn't vote smartly on Glass-Steagall. "Come on Anderson Cooper, you're being a little rough on Linc here. He just arrived in the United States Senate you know the other senators were givin' him swirlies and running him through the spanking machine. He didn't know what to do! I mean, Jiminy Christmas, stop givin' him the business, why doncha ask Jim Webb somethin'; he hasn't talked in like 10 minutes!"